Who Looks After My Hair? The lovely people at Trevor Sorbie Covent Garden have been looking after my tresses for a fair while now, and they do an amazing job! It’s quite difficult being blonde – one bad set of highlights and you can find yourself with hair that’s too yellow or too silvery – then you’ve got those dreaded roots to contend with every month or so! A brilliant colourist should be able to judge the hair tones that suit you best – they should be flattering against your skin and even give your complexion a bit of a ‘lift’. Also, if you’re reasonably low-maintenance, you’ll want colour that either fades evenly or grows out in a way that doesn’t give you a big ‘block’ of roots. I love the look of very blonde hair, but because I am dark blonde naturally, I have found over the years (trial and error!) that a darkish honey blonde with fine highlights works perfectly for me. I digress! I was talking about the lovely people at Trevor Sorbie. 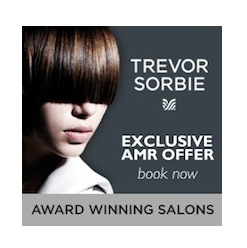 They are offering AMR readers 10% off all colour services until the 30th June 2012, you just need to quote “A Model Recommends” when booking at the salon in Covent Garden. All of the colourists there are excellent at giving honest advice, so whether you’re going for a massive makeover or just want a bit of tonal tweaking, they’re the people to ask! Just click the image in the sidebar (or above!) to go through to their website. FYI, my colourist is John Spanton, but you’ll see when you book that different people have different prices – the receptionist should be able to advise you on a colourist to suit your budget. Never be afraid to talk about prices – it makes for a much more relaxing experience if you know what you’re paying before you get going! Previous Post Jumble of Juicy Things! Next Post Luxe Alert – Prepare to be Seduced!